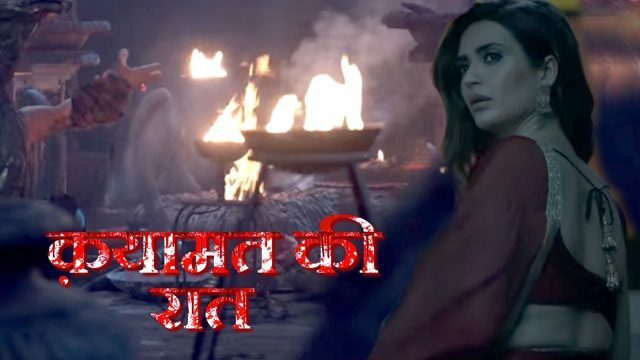 In the latest update of 4th November 2018, Qayamat Ki Raat was Dharma’s mom and sister died. The today’s written update of Qayamat Ki Ratt starts with the celebrations starts in the house. Gauri and Raj will dance together at the songs on Dil Lay Ja. Everyone enjoys the dance. Dharam dances with them too. Anjali takes the trunk out. Kalasur comes out because of this. To saw this they run from here. Kalasur suppresses her. To see this she does not know what to do? She said in a panicky voice and said to leave my mom, please. She runs. He kills the mom of Dharam’s. she cries a lot. Meenakshi said that when will the mon come out. Uma said that we have to wait for a little the moon canes very fast. Meenakshi said to everyone to do Pooja till then. Anjali ran in the jungle. She was panic and there is no one for her help in the jungle. Guru ma tries to fight the hand of the Kalasur. It stabs her. Anjali saw the Haveli. She runs towards it but the hand shuts her mouth. She was trying to give the sound to the Anjali but she can not give any sound. Dhara is waiting for them. Anjali tries to calls the Dharma but he does not see her. Gauri does the art of Raj. After this he makes her drink the water and eat the sweets. He screams to Anjali that how did this happen. She said that he killed to me. He is out. Dharma shouts. He sais that Kalasur. Uma pretends to faint. Gauri took her to her upstairs. Uma asks that how did this happen? We think that we will live in peace. He will be one again. Prithvi said that he can not do anything. Do not be scared he said this. Gauri said that we will save him? Uma said that please leave me to leave for a while. I want to sit alone, and she said that I did not want anyone in front of me. Precap: Dharma comes to the hospital. Uma cames there. Dharma sees at her face. They all get to know Uma’s plan. Gauri runs to stop the doctor from giving Raj Kalasur’s blood.